The apple iphone 6 Lightning Cable is trusted by 5 million+ people for high quality innovative products. Durable nylon fiber cloth for protection, strength, flexibility and helps prevent any tangling. It is ideal to use with long Iphone 6 Charger Cable while in the car, office and at home . 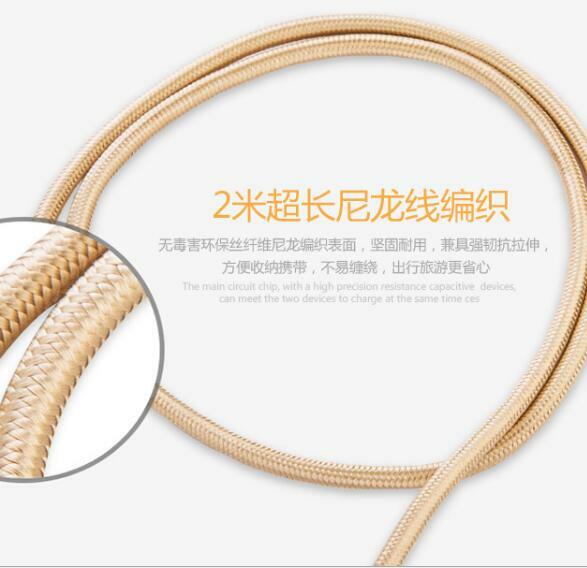 Long Iphone Charger Cable is made with High Gauge Low Impedance wire enabling high performance with many USB devices. Sturdy boot gives this cable added strength and durability . With a length of 6.5ft (2m), this charger cable is twice as long as your average cable. if you want prolong the life of this Long Iphone 6 Charger Cable , When removing it from a port or outlet, always grasp the plug, not the cable. This will prevent undue stress where the cable and the plug meet, an area often prone to damage. We also recommend loosely looping cables when not in use, rather than folding or otherwise aggressively bending them . acturally this Long Iphone Charger Cable is a durable one , above sugestions only in order a further long life , it not only save your money but also give you a relax life . Looking for ideal Apple Iphone 6 Lightning Cable Manufacturer & supplier ? We have a wide selection at great prices to help you get creative. All the Long Iphone 6 Charger Cable are quality guaranteed. We are China Origin Factory of Long Iphone Charger Cable. If you have any question, please feel free to contact us.